Rueben and Felix are the best of friends. They live next door to each other, they're exactly the same age, and exactly the same height (well, Rueben's ears make him a little taller! ), and they're both left-handed. Felix isn't going to take that lying down, so he builds a bubble machine. So Rueben builds a bubble machine. Felix builds a bigger, more complicated one. Rueben builds an even bigger, even more complicated one. Now the competition between them is getting so out of hand that they have to appoint a panel of judges to determine who's really blowing the biggest bubbles. All they can think about is winning. Which leads to cheating. Friendship has been thrown out the window. This is a fight to the bitter end. Who will be crowned champion bubble blower? How will this whole silly drama play out? 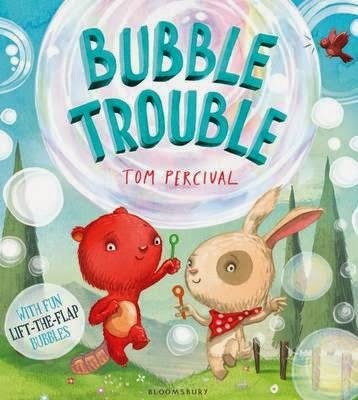 Tom Percival has created a wonderfully enjoyable picture book about the perils of unchecked competition. The gorgeous illustrations are the highlight, perfectly capturing the characters of Felix and Rueben, and bringing to life their incredible bubble-blowing machines. Throughout, there are bubble 'flaps' that can be lifted by little fingers to reveal parts of the story, adding a delightful hide-and-seek element for younger readers. This is fun from start to finish, with a valuable lesson thrown in for good measure.